It's time for another WIPocalypse update! WIPocalypse projects are all of those works in progress that we hope to finish before the world ends. I stitched on a few of my projects this month. 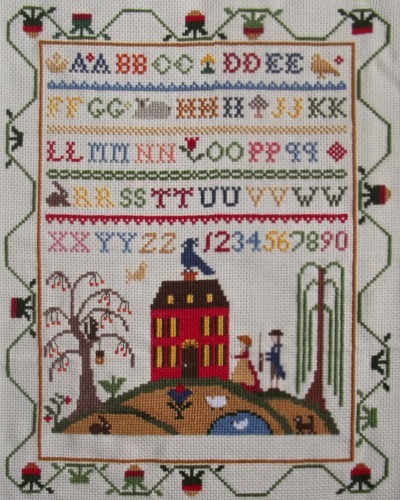 Bothy Threads "Cut Thru' Haunted House" (shown above) is a new project that I started stitching this month. Lots of fun details to be found throughout the chart! I completed stitching February's chart for the Linen and Threads 2019 Mystery Sampler and WHOOPSIE it looks like I went a bit wacky with the lower section of the border. I didn't notice when I was stitching, & I didn't notice when I was taking the photo ... but as I posted the photo, I thought "What have I done?" lol! Looks like I will be going back to "counting class". The final project I worked on this month was "American Sampler" by Sandra Sullivan. I finished the grass & sheep, the windows and door, and worked a bit more on the border. What do you listen to while stitching? I always have the TV on. Sometimes it's movies, sometimes my favorite shows. Nothing in particular. That's all for this update. 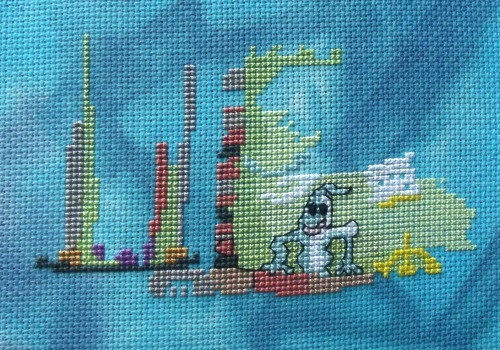 Great progress on your stitching. I love the fabric you're using for the peacock. Very Pretty Projects...Love the Fabric that you are stitching the Peacock on. This is so cool and so awesome looking. Beautiful Stitching. 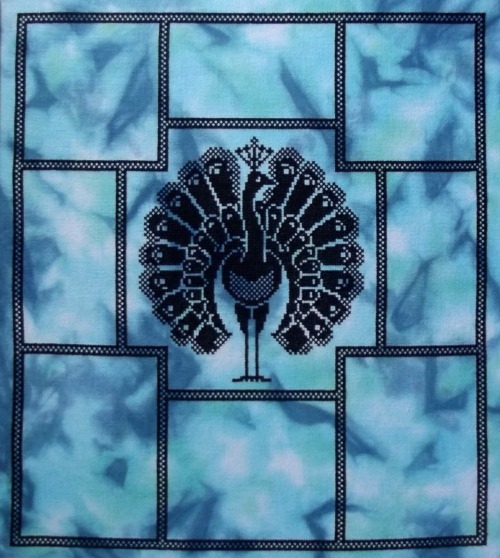 The Peacock looks amazing on that beautiful fabric. I assume the bottom blocks are supposed to be the same size as the top? Can't wait to see what they add next.